This is the time of year where I spend days reaping the benefits of the garden harvest. It’s quite a bit of work, sometimes more than I expect. But, it is worth it in the dead of winter when I am pulling pints of tomato sauce out of the freezer. Real tomato sauce. That spends hours simmering on the stove. I have been perfecting my technique these days. 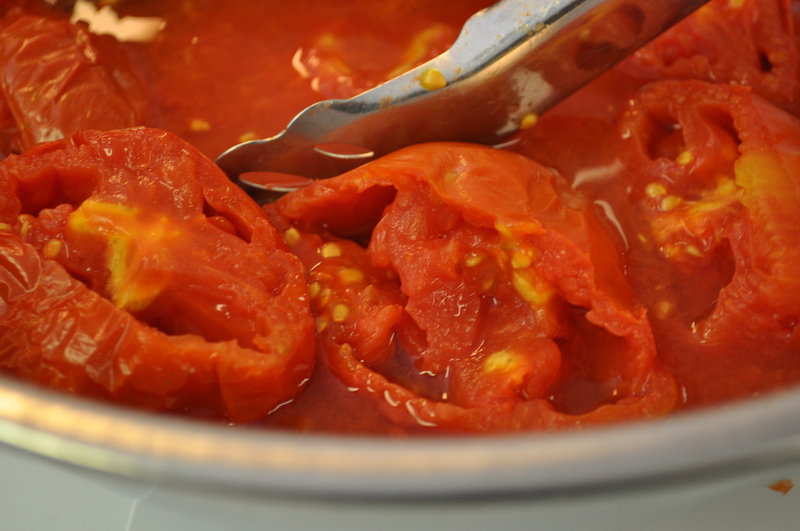 Learning how to best extract the “meat” of the tomato from the seeds and skin. I blanch my tomatoes after cutting the tops off of them. Let them cool down before peeling and seeding. The batch I made yesterday used 24 tomatoes. Yielded two quarts of sauce. I did get lucky with some “gleaned” tomatoes. Split and damaged tomatoes. We were harvesting from one of the community gardens while the plot owner was away. These tomatoes weren’t in the best of shape. Not good to use for food bank harvest. For an avid gardener though, these tomatoes could make some awesome sauce. I cut away quite a bit of them. 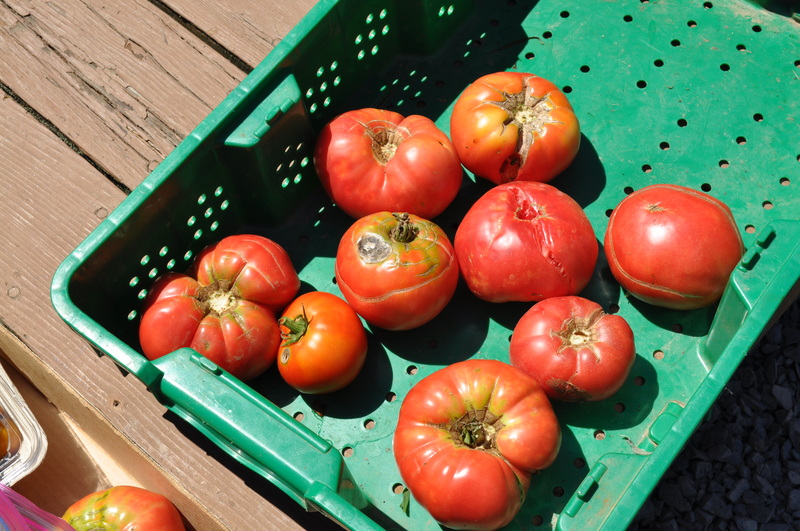 You need to get the infested areas out of the tomatoes, or risk a ruined sauce. My sauce is easy to make, in terms of work. It just takes patience. I start with onions, celery, carrots, sweet peppers, garlic. Sweated down in olive oil. Add the meat of the tomatoes to the pan. Add salt, pepper, Italian seasoning. A pinch of sugar. I like my tomato sauce to be chunky. So I don’t blend it at all. Right now I have a dozen containers in the freezer from three sessions of sauce making. 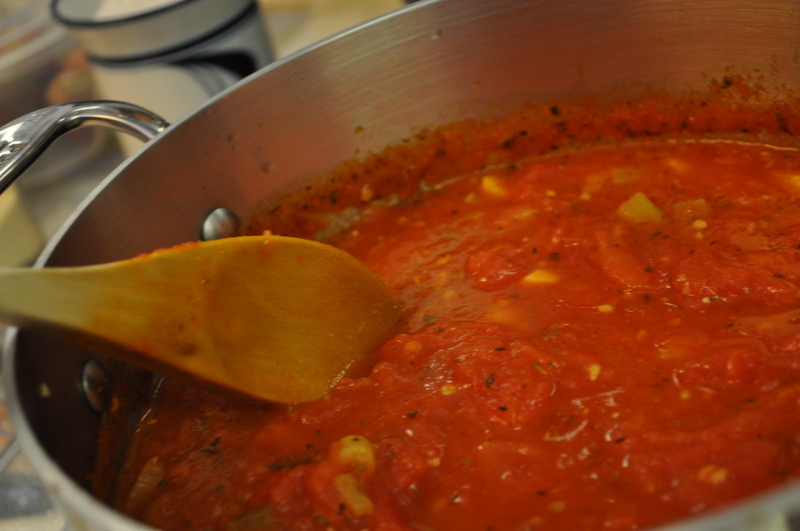 If you have never made your own sauce, you do need to try it. At least once. To see just how much time our ancestors spent putting up food for the winter. It does make you appreciate what we can buy instead of make. Even though I have found that making my own food yields greater flavor. Here’s to harvest, and the fruits of our labor. Posted in Food, Gardening, Real Food and tagged community, cooking, Food, foodie, gardening, heirloom tomatoes, Locavore. Bookmark the permalink. Going to try your sauce recipe, thanks for sharing! Getting so many tomatoes in my CSA, LOVE them!